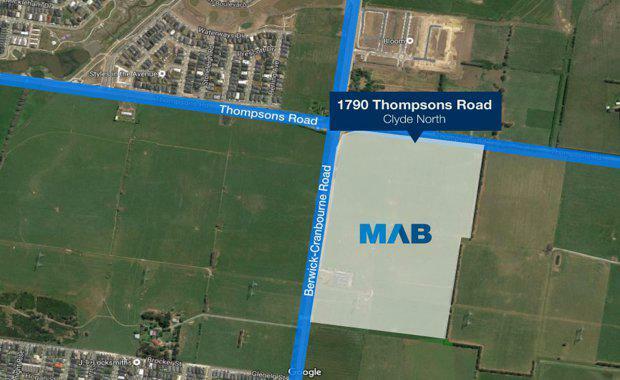 MAB Corporation (MAB) has acquired 38 hectares of land in Clyde North to be developed as a master planned $150 million business park. The large parcel is situated in a prime location for commercial, retail and industrial tenants, on the high exposure corner of Berwick-Cranbourne Road and Thompsons Road, Clyde North. The acquisition further consolidates MAB’s investment in the booming City of Casey and is just eight kilometres away from MAB’s established $77 million Thompson’s Base Business Park in Cranbourne West, and less than 10 minutes from MAB’s current $40 million office developments CubeOne and CubeTwo at Victor Crescent, Narre Warren. The planned development will offer a unique variety of opportunities, including large format retail, a service station and convenience outlets, plus over 70 industrial lots from 1,000m2 in size. “Like all MAB developments, the site will be designed with flexibility in mind and is projected to attract a mix of investors, national retailers and local businesses,” said MAB Development Manager Ian Parry. In addition to catering for both small and large business needs with a flexible lot layout, this new site offers an opportunity to own land within a booming south-east growth corridor. The population of the City of Casey is currently over 300,000, and is heading towards half a million by 2046. “The City of Casey is experiencing rapid population growth and an expanding economy so MAB is excited to make another investment in the region," Business Parks Director Tony Blazevic said. The development will deliver local jobs and take advantage of this unique opportunity to create a dynamic precinct in one of Australia’s fastest growing municipalities. "Clyde North is situated 40 km from Melbourne’s CBD, 6 km south of Berwick and is close to major freeways, local infrastructure and amenity. The site is located within an approved Precinct Structure Plan.